This year's Christmas crackdown on drink-drivers in Wales will not be advertised on TV because of budget cuts by the UK government. Wales' four police forces launch their campaign later with the message that even one drink is too many for drivers. Thousands of motorists face being stopped in the month-long campaign. The assembly government said it was confident its "clear" anti-drink drive message on radio, pub-based and online promotions would resonate with people. 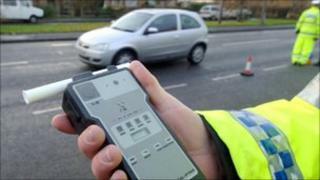 Last year Wales' drink-drive campaign shared in £3.4m spent on advertising by the UK Department of Transport. This year just £550,000 has been allocated. UK Road Safety Minister Mike Penning said the THINK! Christmas drink drive campaign was going ahead despite UK government advertising and marketing spending being frozen in June. He said: "It is vital that we spend taxpayers' money wisely. "That is why we are focussing our spending on activity closest to the points where drivers may risk drink driving and targeting this activity at young men, the most over-represented group in drink drive accident statistics." Former Wales international rugby player Rupert Moon is among those backing the 2010 campaign to keep drink-drivers off Welsh roads. Dyfed-Powys Police is the lead force in Wales in this year's campaign. Assistant Chief Constable Nick Ingram said: "Everybody's metabolism is different and people will process alcohol differently." "What we're saying this year is that even one drink is too much, and could affect your judgement and driving capability. "We cannot calculate how much we can drink safely and then drive - the only safe way is to either drink or drive." A spokesperson for the Welsh Assembly Government said: "Although this year's anti-drink drive campaign will not contain advertising for television or cinema as in previous years, we are confident that our simple message will reach and resonate with all parts of society. "The message is clear: those who choose to ignore the law, risk not only their own lives but the lives of others."